"The fleur-de-lis, at the bottom of the cross, is the international symbol for Mary at the foot of the cross when Jesus died. 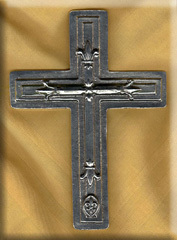 I have designed this cross in honor of mothers and the special love they have for their children. Cast in the highest quality pewter. The cross measure 6 x 9 inches."